WCSD Summer Reading information is posted on the District's site at http://www.wappingersschools.org/page/25. Find your local public library summer reading program. If you haven't read them all during the school year, try the 2012-2013 JJHS library booklists. The lists include award winners, Science Fiction, Mystery & Suspense, Sports in Fiction and more. Teens and other readers of Young Adult Literature will have the opportunity to listen to bestselling titles and required reading classics this summer. 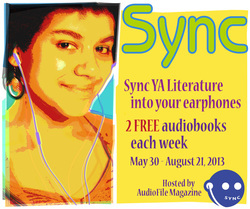 Each week from now until August 21, 2013, SYNC will offer two free audiobook downloads. The audiobook pairings will include a popular YA title and a classic that connects with the YA title's theme and is likely to show up on a student's summer reading lists. For example, Anna Bank's Of Poseidon will be paired with William Shakespeare's The Tempest. To find out when you can download titles to listen to on the run this summer, visit www.AudiobookSync.com. You will need OverDrive Media Console software to download the tiles. It's the same audiobook software used by the MidHudson Library System. If you struggle to download the audiobooks, get Hooper or ask your friendly public librarian.